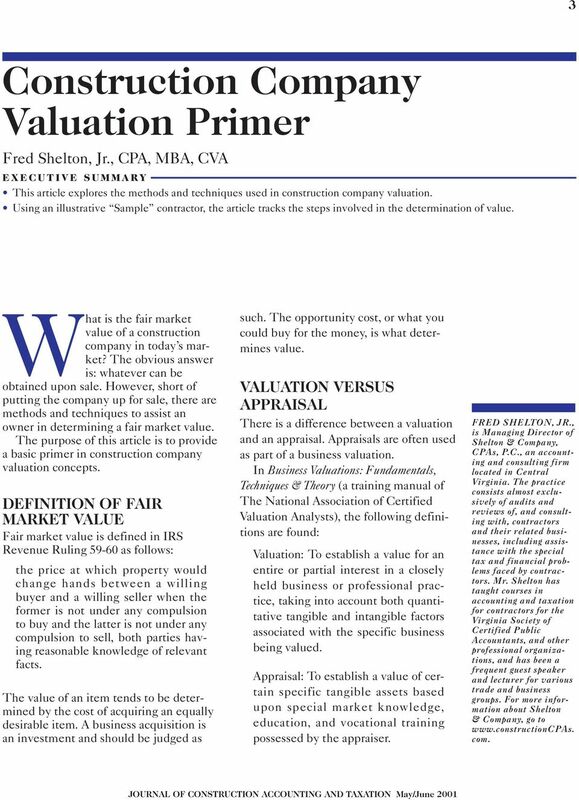 Download "What is the fair market"
1 3 Construction Company Valuation Primer Fred Shelton, Jr., CPA, MBA, CVA EXECUTIVE SUMMARY This article explores the methods and techniques used in construction company valuation. 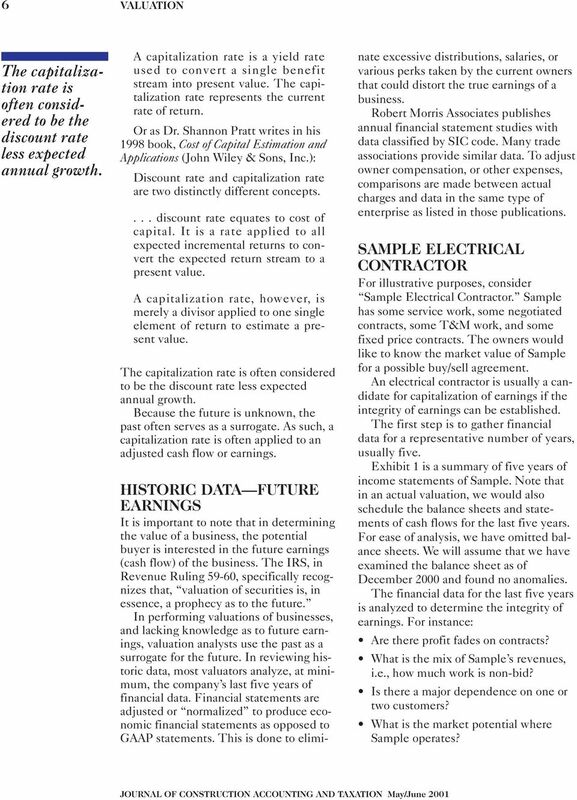 Using an illustrative Sample contractor, the article tracks the steps involved in the determination of value. What is the fair market value of a construction company in today s market? The obvious answer is: whatever can be obtained upon sale. However, short of putting the company up for sale, there are methods and techniques to assist an owner in determining a fair market value. The purpose of this article is to provide a basic primer in construction company valuation concepts. DEFINITION OF FAIR MARKET VALUE Fair market value is defined in IRS Revenue Ruling as follows: the price at which property would change hands between a willing buyer and a willing seller when the former is not under any compulsion to buy and the latter is not under any compulsion to sell, both parties having reasonable knowledge of relevant facts. The value of an item tends to be determined by the cost of acquiring an equally desirable item. A business acquisition is an investment and should be judged as such. The opportunity cost, or what you could buy for the money, is what determines value. VALUATION VERSUS APPRAISAL There is a difference between a valuation and an appraisal. Appraisals are often used as part of a business valuation. In Business Valuations: Fundamentals, Techniques & Theory (a training manual of The National Association of Certified Valuation Analysts), the following definitions are found: Valuation: To establish a value for an entire or partial interest in a closely held business or professional practice, taking into account both quantitative tangible and intangible factors associated with the specific business being valued. Appraisal: To establish a value of certain specific tangible assets based upon special market knowledge, education, and vocational training possessed by the appraiser. FRED SHELTON, JR., is Managing Director of Shelton & Company, CPAs, P.C., an accounting and consulting firm located in Central Virginia. The practice consists almost exclusively of audits and reviews of, and consulting with, contractors and their related businesses, including assistance with the special tax and financial problems faced by contractors. Mr. Shelton has taught courses in accounting and taxation for contractors for the Virginia Society of Certified Public Accountants, and other professional organizations, and has been a frequent guest speaker and lecturer for various trade and business groups. For more information about Shelton & Company, go to com. 2 4 VALUATION It may be more important now than ever to know the fair market value of a construction company. PURPOSE OF VALUATION There are many valid business reasons to have a company valued, including mergers and acquisitions, buy/sell agreements, estate planning, ESOPS, purchase price allocations, litigation, and financing assistance. The purpose for which a company is valued can affect the final outcome. For instance, an estate tax valuation will often be different from the value derived for an active sale of a thriving business. IMPACT OF MERGERS AND ACQUISITIONS ON VALUE The construction industry is highly fragmented, with most companies being closely held. It is, therefore, an industry ripe for mergers and rollups. It may be more important now than ever to know the fair market value of a construction company. Many of the consolidators have been paying multiples of four to six times Earnings Before Interest and Taxes (EBIT) for specialty contractors. This technique, or rule of thumb, is considered risky and may not be indicative of the true value of a company. In reality, a multiple is merely an inverse of a capitalization rate, which is explained later in this article. As with all supply and demand situations, when demand exceeds supply, the cost curve shifts, increasing the price of businesses. VALUATION METHODS There are three commonly used methods, or approaches, employed in business valuations. Each of these methods and their variations are as follows: I. Asset Based Approach 1. Adjusted Book Value 2. Book Value 3. Liquidation Value II. Income Approach 1. Capitalization of Earnings 2. Excess Earnings (Treasury Method) 3. Discounted Future Earnings III. Market Approach 1. Public Company Data Comparisons i. Dividend Paying Capacity ii. Price Earnings Ratios iii. Price/Earnings Before Interest and Taxes iv. Price to Book Value 2. Transaction Databases i. Rules of Thumb ii. Database Comparison The above methods are not equal choices. They are applied to different companies in different situations. The valuation method chosen by a valuator depends on many circumstances. Two Valuation Methods Commonly Used Of the three primary methods of business valuation (the asset based approach, the income approach, and the market approach), two methods are commonly used for construction company valuations. The majority of construction companies are closely held. Because of this, the information concerning a sale of an individual business is private and difficult to obtain. This tends to discourage the use of a market technique. For most construction company valuations, the valuation method is essentially a choice between the capitalization of earnings, or cash flow, versus an adjusted book value method. An adjusted book value is often considered to be a floor of value. When to use a particular method is a matter of judgment. 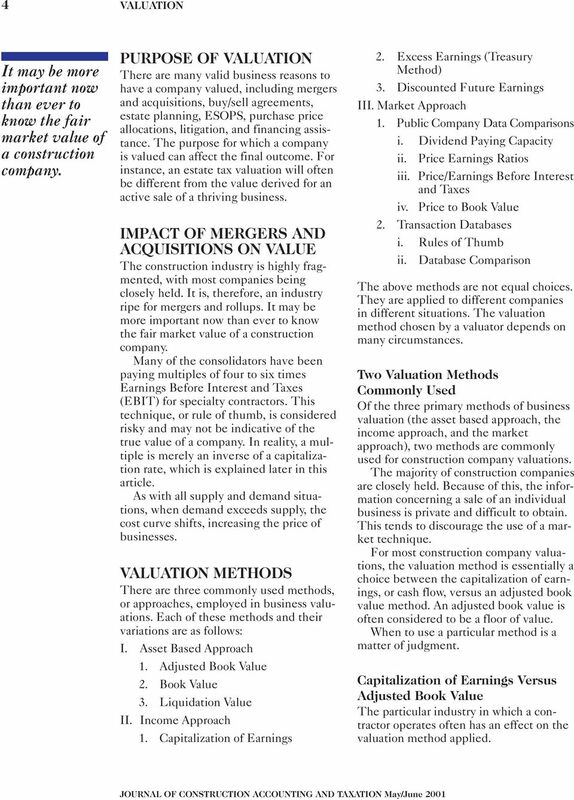 Capitalization of Earnings Versus Adjusted Book Value The particular industry in which a contractor operates often has an effect on the valuation method applied. 3 VALUATION 5 Highway contractors usually have a significant investment in fixed assets, specifically equipment. Because of the nature of depreciation, many highway contractors have hidden equity in their equipment. Often, fixed assets are fully depreciated even though such equipment may have substantial value at auction, or can provide security for financing purposes. With proper maintenance, loaders, dozers, and cranes have a tendency to retain value long after a normal depreciable life has passed. According to the latest Construction Financial Manager s Association (CFMA) survey, for most highway contractors owner s equity will often make up as much as 43 percent of the value of total assets. In addition, the heavy highway market has been intensely competitive over the past several years. Profit margins have been nominal. According to the 2000 Construction Industry Annual Financial Survey, Twelfth Edition, the composite net profit margin for highway contractors was only 3.1 percent. That is down from the year before. In 1999, net profit for reporting companies was 3.5 percent. Because of the hidden equity described above, most highway contractors have a value substantially in excess of the old standard book value. Highway contractors almost always obtain construction contracts by competitive bid, and have little or no negotiated projects. Because of the requirement to be low bidder, and with little assurance of level cash flows, heavy contractors are often poor candidates for capitalization of earnings. By contrast, general contractors often have very little heavy equipment. They are also often highly leveraged with debt and have relatively low owner s equity compared to assets. Because of this, the capitalization of earnings method is often employed in valuation, as opposed to an adjusted book value. Specialty contractors, like general contractors, usually have a much smaller investment in equipment. These contractors tend to be labor intensive and rely much less on equipment. Electrical and HVAC contractors tend to be candidates for the capitalized cash flow or earnings method. DISCOUNT RATES The discount rate applied must be the same as the rate of return being offered to attract capital in the type of business being valued. It is in fact the cost of capital. It is made up of a safe rate of return (i.e., treasury bills) and a rate of return for the additional risk associated with the investment. The two methods most often described in conjunction with the development of a discount rate are the build-up method, discussed later in this article, and the use of the Capital Asset Pricing Model (CAPM). 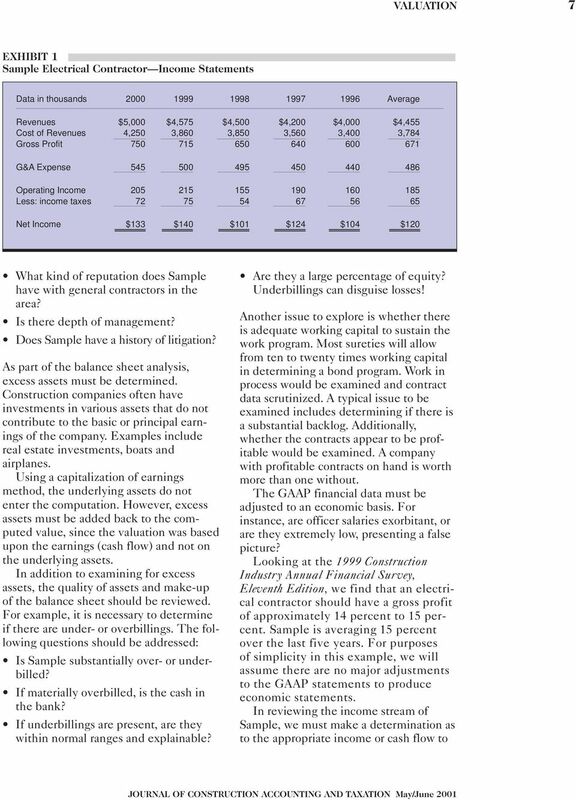 The CAPM assumes that expected return is equal to a risk free rate, plus beta, times the expected return, less a risk free rate. The major problem with this technique is that you need to know the return on investment. Return on investment is calculated based upon the price of the stock. If the stock price is available, why is there a need for valuation calculations? DISCOUNT VERSUS CAPITALIZATION RATES Many use the terms discount rate and capitalization rate as if they were interchangeable. They are usually not! James R. King, CPA, CVA, in his treatise, Development of Discount/Capitalization Rates (The National Association of Certified Valuation Analysts, 1998), gives the following definitions: A discount rate is a yield rate used to convert an anticipated future benefit stream into a present value. The discount rate represents the total rate of return the investor expects to realize on his investment. This is the return received while holding the investment as well as the proceeds on liquidation of the investment. The discount rate applied must be the same as the rate of return being offered to attract capital in the type of business being valued. 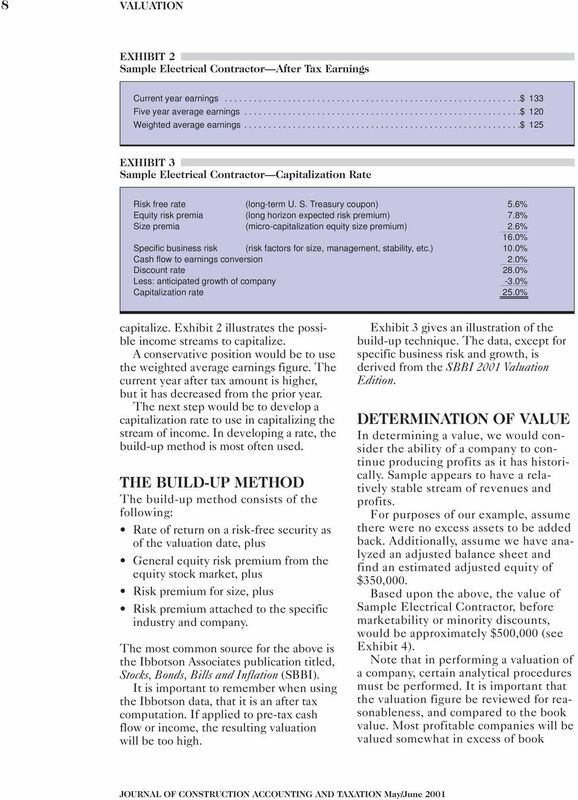 4 6 VALUATION The capitalization rate is often considered to be the discount rate less expected annual growth. A capitalization rate is a yield rate used to convert a single benefit stream into present value. The capitalization rate represents the current rate of return. 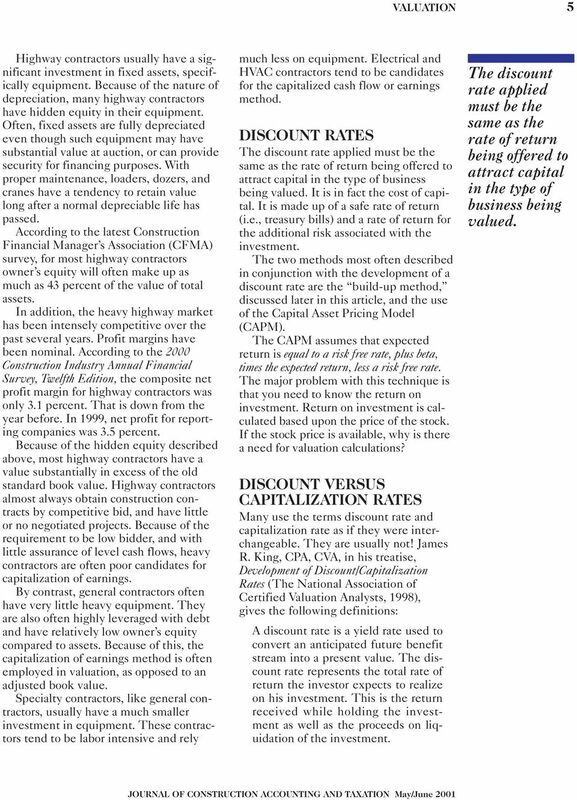 Or as Dr. Shannon Pratt writes in his 1998 book, Cost of Capital Estimation and Applications (John Wiley & Sons, Inc.): Discount rate and capitalization rate are two distinctly different concepts.... discount rate equates to cost of capital. It is a rate applied to all expected incremental returns to convert the expected return stream to a present value. A capitalization rate, however, is merely a divisor applied to one single element of return to estimate a present value. The capitalization rate is often considered to be the discount rate less expected annual growth. Because the future is unknown, the past often serves as a surrogate. As such, a capitalization rate is often applied to an adjusted cash flow or earnings. HISTORIC DATA FUTURE EARNINGS It is important to note that in determining the value of a business, the potential buyer is interested in the future earnings (cash flow) of the business. The IRS, in Revenue Ruling 59-60, specifically recognizes that, valuation of securities is, in essence, a prophecy as to the future. In performing valuations of businesses, and lacking knowledge as to future earnings, valuation analysts use the past as a surrogate for the future. In reviewing historic data, most valuators analyze, at minimum, the company s last five years of financial data. Financial statements are adjusted or normalized to produce economic financial statements as opposed to GAAP statements. This is done to eliminate excessive distributions, salaries, or various perks taken by the current owners that could distort the true earnings of a business. Robert Morris Associates publishes annual financial statement studies with data classified by SIC code. Many trade associations provide similar data. To adjust owner compensation, or other expenses, comparisons are made between actual charges and data in the same type of enterprise as listed in those publications. SAMPLE ELECTRICAL CONTRACTOR For illustrative purposes, consider Sample Electrical Contractor. Sample has some service work, some negotiated contracts, some T&M work, and some fixed price contracts. The owners would like to know the market value of Sample for a possible buy/sell agreement. An electrical contractor is usually a candidate for capitalization of earnings if the integrity of earnings can be established. The first step is to gather financial data for a representative number of years, usually five. Exhibit 1 is a summary of five years of income statements of Sample. Note that in an actual valuation, we would also schedule the balance sheets and statements of cash flows for the last five years. For ease of analysis, we have omitted balance sheets. We will assume that we have examined the balance sheet as of December 2000 and found no anomalies. The financial data for the last five years is analyzed to determine the integrity of earnings. For instance: Are there profit fades on contracts? What is the mix of Sample s revenues, i.e., how much work is non-bid? Is there a major dependence on one or two customers? What is the market potential where Sample operates? 7 VALUATION 9 EXHIBIT 4 Sample Electrical Contractor Computation of Value Weighted average earnings $ 125 Divided by capitalization rate (multiply by inverse of cap rate) x4 Computed value $ 500 value. A book value, or adjusted book value, is a floor below which value should not normally fall. The estimated adjusted equity of $350,000 should, therefore, be contrasted with the $500,000 amount shown in Exhibit 4. LACK OF MARKETABILITY DISCOUNT After determining a base amount there is still one more concept to consider, that of discounts. Many owners of companies who have a valuation performed are surprised that a discount is applied to the final estimated value. That final deduction from estimated value is for lack of marketability of the company. 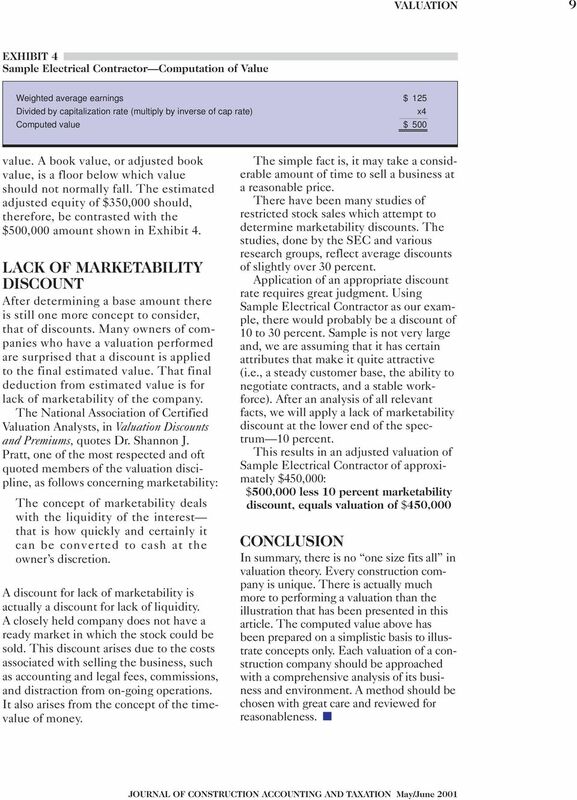 The National Association of Certified Valuation Analysts, in Valuation Discounts and Premiums, quotes Dr. Shannon J. Pratt, one of the most respected and oft quoted members of the valuation discipline, as follows concerning marketability: The concept of marketability deals with the liquidity of the interest that is how quickly and certainly it can be converted to cash at the owner s discretion. A discount for lack of marketability is actually a discount for lack of liquidity. A closely held company does not have a ready market in which the stock could be sold. This discount arises due to the costs associated with selling the business, such as accounting and legal fees, commissions, and distraction from on-going operations. It also arises from the concept of the timevalue of money. The simple fact is, it may take a considerable amount of time to sell a business at a reasonable price. There have been many studies of restricted stock sales which attempt to determine marketability discounts. The studies, done by the SEC and various research groups, reflect average discounts of slightly over 30 percent. Application of an appropriate discount rate requires great judgment. Using Sample Electrical Contractor as our example, there would probably be a discount of 10 to 30 percent. Sample is not very large and, we are assuming that it has certain attributes that make it quite attractive (i.e., a steady customer base, the ability to negotiate contracts, and a stable workforce). After an analysis of all relevant facts, we will apply a lack of marketability discount at the lower end of the spectrum 10 percent. This results in an adjusted valuation of Sample Electrical Contractor of approximately $450,000: $500,000 less 10 percent marketability discount, equals valuation of $450,000 CONCLUSION In summary, there is no one size fits all in valuation theory. Every construction company is unique. There is actually much more to performing a valuation than the illustration that has been presented in this article. The computed value above has been prepared on a simplistic basis to illustrate concepts only. Each valuation of a construction company should be approached with a comprehensive analysis of its business and environment. A method should be chosen with great care and reviewed for reasonableness. ISS Governance Services Proxy Research Company Financials Compustat Data Definitions June, 2008 TABLE OF CONTENTS Data Page Overview 3 Stock Snapshot 1. Closing Price 3 2. Common Shares Outstanding 3 3. Midland Energy/Sample 2. Midland Energy Resources, Inc.
Midland Energy Resources, Inc. Midland Energy Resources, Inc. is a global energy company that operates in oil and gas exploration and production (E&P), refining and marketing (R&M), and petrochemicals.